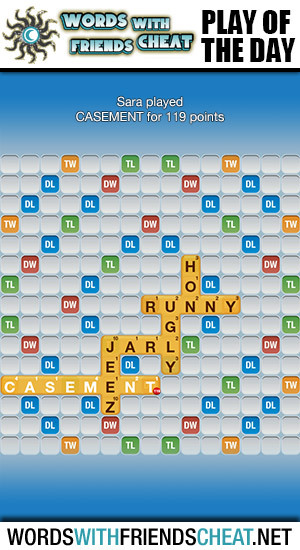 Today’s Words With Friends – Play Of The Day is CASEMENT (119pts) and was submitted by Words With Friends Cheat user Sara. What we’re seeing here are the ingredients for a nice relaxing game. If you can play such a devastating word so early in the game, take the opportunity. There’s nothing to raise your blood pressure like a close and drawn out game. Seal the deal early on. This creates the ideal opportunity to try new things, and test new strategies. 1. a window sash opening on hinges that are generally attached to the upright side of its frame. 2. Also called casement window. a window with such a sash or sashes. 3. a casing or covering.